Dayo Adeneye is one of the modern day pioneers of entertainment business in Nigeria. With his bosom friend, Kehinde Ogungbe, he has revolutionalised the industry ... in the country. In this Interview with Funmi Elugbaju, Adeneye speaks about his life, works, and erstwhile unknown family life. What is your involvement in the Hip Hop World Awards? I am a stakeholder in the music industry being a part of Kennis Music and Prime Time Entertainment. We are part of the music industry, we were also inducted into the Hip Hop World music Hall of Fame during their maiden edition. So, we feel like a part of the family. How is your new Television station faring? It is doing quite well. It is an extension of what we do on the terrestrial TV. It's an extension of Prime Time Africa. We call it Prime Time Extra. It's a 24-hour entertainment channel. We try to promote not just Nigerian music but African music, black music in the Diaspora. We also promote our culture, language and everything good about ourselves. In a situation where the terrestrial TV station covers just one hour, some of these glamorous events that we cover, like the World Music Award, grammys are like three-to-four hours but you have to cut it down and edit it and you lose a lot of footage and leave out a lot of information. But the 24-hour channel enables us to do more; do more things, pass out more information. Nigerians don't have to wait for two times in a week or one time in a week to watch their favorite Prime Time programme. They can watch it 24 hours. The channel is on Daarsat (Darr communication Satelite) if you subscribe to Daarsat you can get it. Recently, fire gutted the home of your friend, Kenny Ogungbe. How is he faring? Hope he has got over it? It was an unfortunate incident, we don't pray for such things to happen. We thank God no life was lost. It was devastating but we thank God it was put under control immediately. He is handling it well, He is taking it in his strides. Talking about TV presenting, it's been noted that after a while people step aside for younger upcoming acts to take over. Are you planning to leave Television presenting anytime soon? I don't see how that works for me. I enjoy what I do and I feel I am the best at what I do. The day I start feeling like I can no longer do it, that's when I will quit. I won't step aside because someone is saying that I have been doing it for five years or 10 years. Oprah Winfery has been doing her show for over 20 years. Who do you think is going to replace her? Larry King, for over 35 years. Who do you think will replace him? Brands were built around those two icons. Some of our programmes are built around us. We have created other programmes that are built around other people, but the programmes and things that I enjoy doing, I am not going to quit doing them, because I enjoy it. The day I feel I am no longer enjoying what I do or I no longer think I am capable of doing it, then I will move to other things. That's just the typical Naija way of doing things, saying don't you think you are too old to be doing this? If you are the best at what you do, then you keep doing it. Why would I want to leave something that I am a part of? It's like asking, 'can you ever leave your child?' Why would I want to do that? I don't like that question, so let's skip it. I don't want a story made out of what's not it. So what's your relationship like with Kenny? We are friends, we are brothers. We share our goals and aspirations. It's cordial, it's very good. Can you tell us how it all started with Kenny. How did you meet? 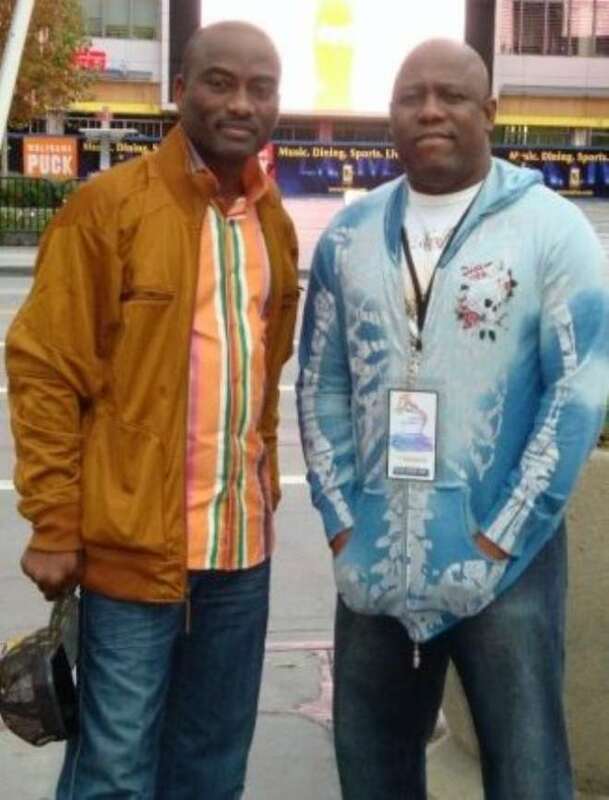 We went to school together in America, we were in the same class and we had the same family friends back in Nigeria and so it was easy for us to become friends, Two strange young men in a foreign land trying to survive and get an education, we basically read the same courses and were usually in the same classes. It was easy to get along and trying to survive. That was how we became friends. Have you guys ever quarreled? Of course we are humans and two distinct personalities. The Yoruba say even the tongue and the teeth still quarrel and the teeth bite the tongue once in a while and they still work together to feed the body. We have disagreements; yes, but we agree to disagree and disagree to agree. Did you ever think you would be in the entertainment industry? To be sincere with you, I am not surprised that I am in it. But, maybe not to this extent. Whatever I do in life, it has to be with something that will impact my community and society. I did it in teaching in America and Management. I enjoy impacting lives, sending information, putting smiles on people's faces. Those are the things that make me happy and make me feel fulfilled. Short of going into politics, I think it is a good way in impacting lives. I always tell people that for every Tuface, for every Eedris Abdulkareem, for every Tony Tetuila and Dbanj that succeed, they in turn employ other people like band managers and dancers. So, they are stimulating the economy and impacting lives, they become role models for young ones, Those kinds of thing make me smile to be a part of it. Did you think you would ever make it this big? Donald Trump always said that if you want to think at all, think big. So, I always think big and not limit myself with small thoughts. If I am going to do anything at all, I go all the way. They will always say reach for the moon even if it means you are going to be among the stars. If you are going to do anything, do it well..
How do you cope with female admirers? Just the way I cope with male admirers. I always tell people that 60- 70 percent of my fans are male. You take it in your strides. You don't let anything get into your head. The day you start thinking, 'they love me oh. They love me.' You are on the losing part. I always keep things in perspectives. I try to tell myself that these people enjoy what I do in terms of entertainment, what I do in terms of entertainment, what I do on TV still rub off on what you do. But if you keep things in perspectives, you will have no problem..
How do you cope with stardom? It's a double-edged sword. It has its advantages and it has its disadvantages. Having a known face opens doors for you. I can't lie about that. People are willing to help you. But on the same note it has its own disadvantages because there are some things you will not be able to do because you have become a public person. You have to be careful of what you do and say because you are also a role model. So, I keep all those things in mind and I try to live a positive life but I won't say I am a saint because I understand a lot of young people aspire to be like me and aspire to do the things that I do, so I try as much as possible to be very careful in the things I do in public. How did you meet and fall in love with your wife? What has marriage taught you? A lot of patience. Marriage is not just about love. It's a commitment, it's a partnership, it's about tolerance. You pray and hope that the other person can tolerate your excesses and your bad sides and you also learn to be tolerant of the person's good and bad sides. It's a partnership that the two parties have to contribute to in making it a success. So what do you appreciate most in your wife? How many people are signed into your record label? Not really. I hate to be among the people who keep asking government to do things but the entertainment industry needs government attention. Look at how big the telecoms industry has grown because government intervened and provided an enabling environment. Short of NEPA, government needs to help the entertainment sector. I mean, look at these young men that are doing Nigeria proud. Anywhere D banj goes, whether it is Ghana or South Africa, they represent Nigeria, the brand. They do positive things. When they go somewhere, nobody is saying anything about 419 or calling them drug pushers. They are representing Nigeria, they are representing our culture. Government can tap into that, invest in the entertainment industry, they will reap bountifully from it. Do you get angry at all? Of course I do. I am a human being but I am slow to anger. Anger doesn't really get you anywhere but helps you to blow off steam once in a while. Anger escalates the cause of your anger so what I try to do is before I blow my head, I try to find out what exactly is the cause of my anger and go to the root of the problem. I try not to speak in anger. Who is the real Dayo Adeneye? I am just a normal human being, a normal Nigerian trying to survive, trying to live daily and contribute my own little quota in my own small corner of the world, trying to raise my children in a good way, trying to be a good father and a good husband. Where do you see yourself in 10 years' time? God has been good. I am okay. My pastor always tells me, 'don't be afraid to enjoy the fruit of your labour.' I work very hard. The Lord knows that I work very hard. I am not stinkingly rich or poor. But I am okay. God takes care of me and my need and I am able to take care of my children and their education, so I am okay. To be honest with you, I don't have the same energy I used to have when I was 20, 25. I try to spend most of my time with my family. You know this type of job that I do, I have to travel a lot, you work weekends and overnight so you spend quite a bit of time from family. So, the free time I do have I try to spend it with my children and my wife and family. Once in a while I hang out with my friends. We have occasions, some of these events that we do go to create avenues to unwind and let your head down and regain your sanity from the stress of everyday life. I pattern most of my life after my late father. Every time I find myself in a situation I always think of what my father would have done in this situation. Most of my life I think I have always gone back to that. My late father is my role model.